A warm welcome to another talented Crooked Cat author today. I enjoyed Yvonne Marjot’s first novel, and look forward to another trip to the Hebridean Islands, which make me think of Mendelssohn. Over to you, Yvonne. 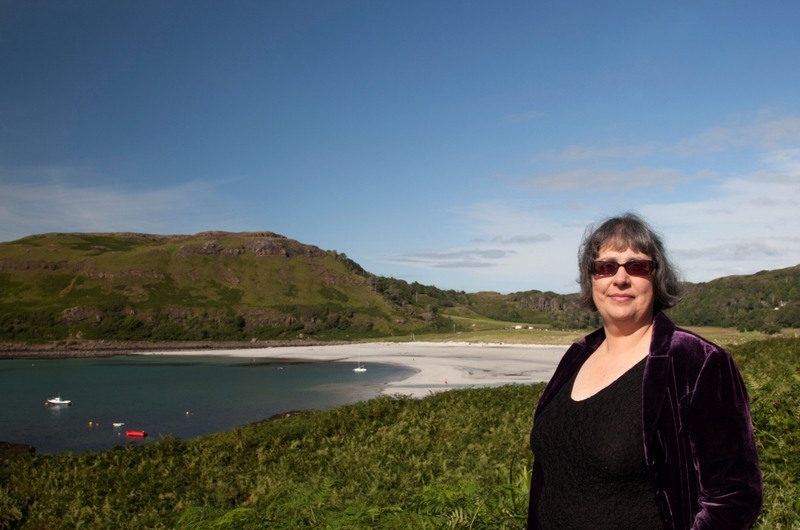 “The Isle of Mull, of isles the fairest”, goes the old song (An t’Eilean Muileach, an t’eilean àghmhor…). It certainly is, and as the setting of The Calgary Chessman it introduced readers to one of the many beautiful islands that stud Hebridean waters like green jewels on a velvet throw. The islands of the Inner Hebrides each have their own character. There’s Skye, where in 1746 Bonnie Prince Charlie fled with Flora MacDonald on her bonnie boat ‘like a bird on the wing’. Skye has mountains fiercer than Mull, the Black Cuillins offering a more challenging climbing experience than the gentle slog up Ben More, Mull’s only Munro. Islay is justifiably famous for its distilleries; it has more than any other island, and has produced many world-class whiskies. Every year it’s also a sanctuary for fifty thousand wild geese, which overwinter in its fields and bays. Among the smaller islands, Rum is a sanctuary for wildlife, and its resident population of red deer has been much studied. The Cuillins of Rum are a lower but no less impressive visual accompaniment to the Black Cuillins of Skye, and on a clear day both may be viewed from the north coast of Mull, as well as the small isles of Muck, Eigg and Canna, and the lonely pairing of Coll and Tiree, sheltering Mull from the west. Famous Staffa, celebrated in poetry and music and most of all in Mendelssohn’s composition, Fingal’s Cave, occupies a special place amongst the Hebrides, as do the Treshnish Isles where puffins abound. One isle is greener and fairer than all the others – the Isle of Lismore, tucked into the mouth of Loch Linnhe and only a swift trip by birlinn (medieval-era boat) from the south-east coast of Mull. It’s described in the Gaelic song Fagail Lismor (Leaving Lismore) as ‘s an t-eilean beag uain’ an caidreabh a chuain (the little green isle in the embrace of the sea). Its name comes from the Gaelic Lios Mhor, the Great Garden, and its limestone basement rocks produced a small but fertile landscape that fed its tiny population successfully even when communities round about were being cleared in the midst of famine. There’s no doubt Lismore was affected by the clearances (the song ‘Leaving Lismore’ being one indication) but there’s something about the island that makes it feel like a sanctuary from the troubles of the world. It’s no accident the place has its own saint. Moluag of Lismore may not be as famous as Columba, Columcille of Iona, but his presence is well attested in the literature, and the people of Lismore are proud of their ecclesiastical heritage. Moluag is traditionally held to have founded his own monastic lineage on Lismore, with monasteries in other nearby locations including the Isle of Tiree. In his book Lismore, The Great Garden (Birlinn Press), Robert Hay describes the ‘bachuil of St Moluag’, a piece of blackthorn wood studded with bronze nails (which once fastened a copper coating onto the stick); the Livingstone Barons of Bachuil have held chartered responsibility for this relic since the sixteenth century, and claim that it once belonged to Moluag himself almost a thousand years earlier. It might seem outlandish to imagine a tiny island in the middle of nowhere having its own cathedral, but nonetheless, Lismore did, and the diocese of Lismore played an important part in the affairs of the Middle Ages. There was a Great Book of Lismore (although this may have more to do with the monastery of Lismore at Bangor in Ireland) and once there was a ‘Life’ of St Moluag of Lismore, just as we are able to read the ‘Life’ of Columba, which still survives. On this tiny island, a monastic lineage that saw itself equal to Columba’s was founded and thrived, and it was a pleasure to me to uncover this history, learn as much as I could about it, and turn it to my own ends. Like the Calgary Chess Queen, Cas’s discovery on Lismore is fictional, but it is founded on the story of a real place, which is, if anything, even more fascinating than the story I have created. I hope you enjoy reading about it. Now, here I have a confession to make: I have never set foot on the Isle of Lismore, despite passing in the ferry hundreds of times when travelling between Mull and the mainland. So I have no pictures of this beautiful place to share. If you are interested, you could visit the website of the Lismore community, which has many photographs of the island and its environs. This entry was posted in Authors and tagged Crooked Cat, Fingal's Cave, Hebrides, Isle of Lismore, Lismore, Mendelssohn, Rum, Skye, Yvonne Marjot. Bookmark the permalink. Here I am on the lovely Jane Bwye’s blog. It’s launch day for The Book of Lismore, so it seemed a good time to talk about Scottish islands. There is a lot tucked away in that Lismore county website. I love islands, and this one at 2300 hectares has a lot on it. So cool having the book created around this tiny island. So you’ve been there, Carl! Isnt our world wonderful; makes me wish the impossible – that I could visit every part of it. I’m glad I caught your interest, Carl. Lismore is amazingly complex for such a tiny place.